Today SSC has uploaded a Notice regarding representation for wrong answers of SSC CGl 2016 Tier 1 Answer Key. You may download the Notice from the link provided below. 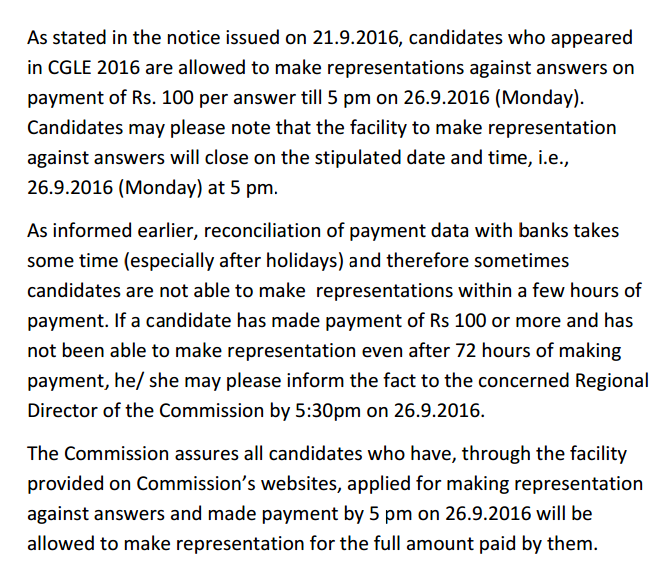 As stated in the notice issued on 21.9.2016, candidates who appeared in CGLE 2016 are allowed to make representations against answers on payment of Rs. 100 per answer till 5 pm on 26.9.2016 (Monday). Candidates may please note that the facility to make representation against answers will close on the stipulated date and time, i.e., 26.9.2016 (Monday) at 5 pm. As informed earlier, reconciliation of payment data with banks takes some time (especially after holidays) and therefore sometimes candidates are not able to make representations within a few hours of payment. 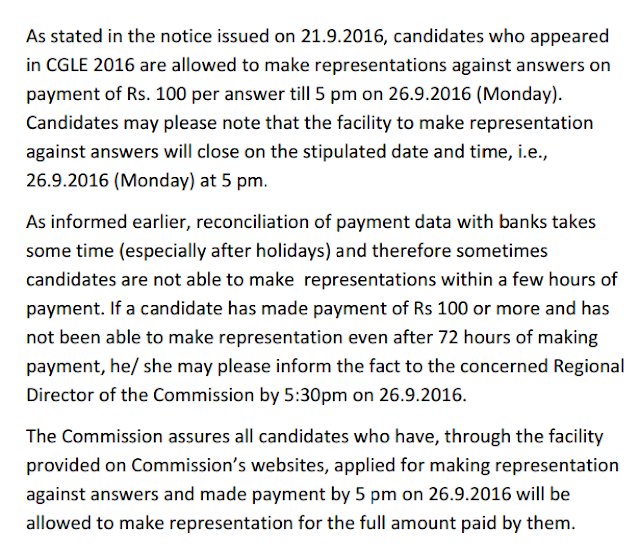 If a candidate has made payment of Rs 100 or more and has not been able to make representation even after 72 hours of making payment, he/ she may please inform the fact to the concerned Regional Director of the Commission by 5:30pm on 26.9.2016. The Commission assures all candidates who have, through the facility provided on Commission’s websites, applied for making representation against answers and made payment by 5 pm on 26.9.2016 will be allowed to make representation for the full amount paid by them.